The properties of natural rubber latex coagulated by acid and microorganisms during accelerated storage were contrasted, respectively. 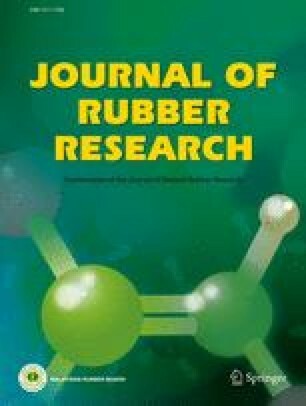 The molecular weight, gel content, Mooney viscosity, Wallace initial plasticity and the plasticity retention index of natural rubber latex during the accelerated storage period were analysed. The results indicate that prolonged storage time leads to a gradual increase in the molecular weight, gel content, crosslink density and Wallace initial plasticity, whereas plasticity retention index reduces. Wallace initial plasticity exhibits significant correlation, while plasticity retention index indicates a negative correlation with both molecular weight and gel content, respectively. The molecular structure and properties of natural rubber latex coagulated by microorganisms are significantly different from those of natural rubber coagulated by acid. The molecular weight, gel content and Wallace initial plasticity of natural rubber latex coagulated by microorganisms are higher than those of natural rubber latex coagulated by acid, while plasticity retention index and protein content of natural rubber latex coagulated by microorganisms is lower than that of natural rubber latex coagulated by acid.